This incredible adventure takes you to far Northern Mongolia, behind the Khoridol Saridag mountain range – a mystical land of prairie, boreal forest and hundreds of lakes scattered over the wide plains of the Darkhad lowland. This is a true winter wonderland adventure and you’ll travel through some of the most pristine and unpopulated lands in the whole of Mongolia. Deer, wild boar, squirrel, beaver, otter, ermine, marten, sable and wolf inhabit this remote region, which forms part of Siberia. 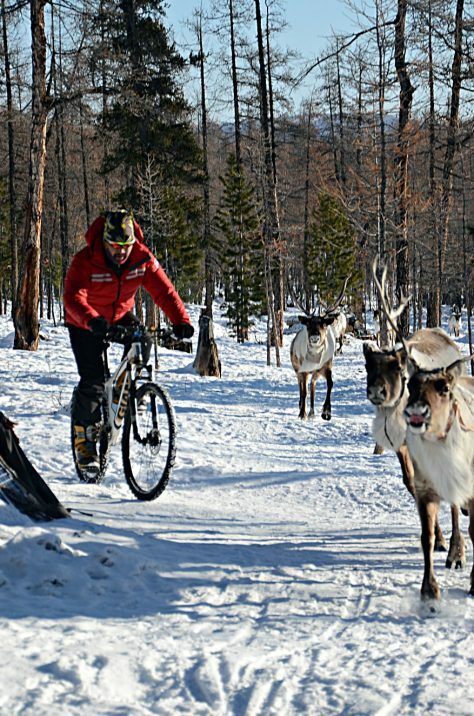 You’ll also get to witness the authentic culture of reindeer herders – of whom there are a just a few hundred – who live in tepees and graze their reindeer in taiga forest and on alpine valley. Dates and Prices to follow. If conditions allow us to build a secure snow hole and you wish to spend a night in it, then please bring a 4 season sleeping bag that is rated to -10C. Choose a sleeping bag that functions within the comfort rating of this temperature. A silk liner will enhance this rating on the coldest nights.